To plants, soils are much more than a place to anchor their roots; they are a critical source of sustenance, including nutrients and water. the amount of decayed organic matter and microorganisms. Because each species of plant can tolerate only a certain range of each of these properties, soil type is a key factor that constrains which plants grow where. Differences arise from differences in the underlying geologic substrate or parent material (such as bedrock or gravel ) and differences in how long the soils have been forming and what natural processes have been acting on them. The first step is the mechanical and chemical breakdown of geologic parent material into small mineral fragments through the process of weathering , which includes the actions of water and of biological organisms. Over long periods of time, the particles become sorted into distinct layers (or horizons) that form what is known as the soil profile . Different soil types are identified and mapped by soil scientists based not only on the type of parent material, but also on the types and arrangement of the layers present, and the position in the landscape (for instance, whether on a steep slope, gentle slope, or level ground). The most familiar soil layer to most people is the topsoil, where millennia of physical, chemical, and biological action have mixed decayed organic matter with mineral particles to produce up to several inches of rich, dark soil. This thin and fragile layer, where most of the soil’s biological activity is concentrated, is extraordinarily important to the success or failure of any given plant and the larger community it occurs within. Ecobit: Soil—It’s Not Just Dirt! When topsoil is stripped away—by erosion, or by earth-moving activities such as development—the remaining underlying, biologically inactive soil is much less conducive to plant growth. Topsoil can take centuries or even millennia to completely re-generate. Soil texture, along with the amount of organic matter in the soil, greatly impacts how much water and nutrients the soil can hold and because of this, soil texture plays an important role in influencing which plants can grow where. 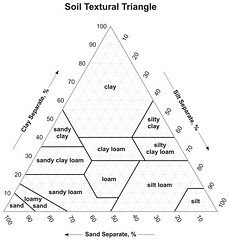 Click this chart to see different soil textures and what percentage of clay (the finest particle size), silt (fine), and sand (coarse) each contains. In general, finer-textured soils hold more moisture and plant nutrients than coarser-textured soils, whose larger spaces between soil particles promote faster drainage and loss of plant nutrients through the process known as leaching . Soils with a higher content of small particles (clay and silt) are often considered more fertile because they have a higher capacity for holding nutrients like calcium, magnesium, and potassium than sandy soils. (However, extremely clayey soils can create other problems for many plants.) A mixture of soil particles of different sizes is generally the most conducive to plant growth. Some plant species, however, are well-suited to soils of specific textures—even extreme textures. For instance, sugar maple and American basswood do better with finer-textured soils that retain more moisture and nutrients, while Virginia pine and dry-site oaks such as chestnut oak and black oak are more common on coarser, drier soils where their drought-tolerance gives them a competitive advantage over other plants. The standard measure of acidity, pH, is another soil property important to plants. Soils with very low or high pH are considered " infertile " (unsuitable for most plants). Why? If the soil is too acidic (low pH) or too basic (high pH), the microorganisms that are required for converting nutrients into a form plants can absorb may be unable to survive. Several factors influence soil pH, the first of which is the mineral content of the parent material. But soil pH continues to be modified by natural processes, many of which (such as leaching) act on the soil to slowly remove base elements and increase the acidity over long time spans. Less acidic soils contain measurable amounts of calcium, magnesium, and other base elements that generally promote greater fertility and more vigorous plant growth. Interestingly, nutrient-enriched soils can sometimes be found even where the underlying parent bedrock does not contain significant amounts of these bases. Where groundwater surfaces in ravines and along the bottoms of hillsides, for instance, it carries with it dissolved bases leached from soils and bedrock higher in the landscape, thereby enriching soils and benefiting plant communities lower in the landscape. Floodplain (or alluvial ) soils, too, are often rich from the plants’ perspective, regardless of what bedrock they overlie. Floods regularly deposit sand and silt on top of the existing soils. Much of this alluvium consists of fresh material derived from a variety of rocks higher in the watershed and, therefore, contains an ample supply of a wide range of nutrients. Moreover, the shells of mussels and snails contribute abundant calcium to some floodplain deposits. These differences in soil fertility directly influence plant diversity in natural communities . Plant communities growing on more strongly acidic, leached soils tend to contain fewer types of plants, because only select plants can tolerate these more extreme conditions. In contrast, plant communities growing on soils containing more calcium and base nutrients can harbor a much wider array of plant species—especially herbaceous (non-woody) ones. These communities have the potential to appear quite lush in spring and summer. Many trees also tend to grow quite large in fertile soils. Ecologists refer to natural communities growing on these soils as "Basic," meaning they need generous amounts of the base nutrients these soils supply. Ecobit: "Basic" and "Acidic"